To describe how the C34Es handled Dolby Atmos height information, I'll start with Patriots Day. Sure, there are explosions and gunfire (both automatic rifles and pistols), which the RSLs handled just fine. However, they shined in the quiet parts where the height channels were only asked to support the incidental music and tension-creating effects. The localization and spaciousness were amazing. True to the Atmos promise, the experience was highly immersive. With Rogue One, the sonic impact was impressive, with the added qualities of smoothly handling the low rumbles without muddying up the dialogue and high-frequency laser blasts, which can cause sonic trouble for lesser speakers. Switching between three adjacent listening positions I was unable to tell where the speakers were as the Dolby Atmos processor smoothly moved sonic objects all around me with no off-axis coloration. The benefit of height speakers is the added dimension many refer to as an enveloping sphere rather than the pre-Atmos, pre-DTS:X surround on a flat plane soundstage. At 1:05, the soft dialogue between Governor Tarkin and Galen Erso is front and center while rain effects fall from the sky and a minute later the Alliance fighters attack ... laser blasts ensue! This is a great test of your system's ability to put you in the middle of the action. Arrival has lots of ethereal musical pads and washes, along with dynamic dialogue ranging from whispers to shouts, and the C34Es were absolutely up to the task. Helicopter sounds begin around the 14:30 mark. At 15:20 there is one that comes right at you, then you are in the copter's cabin on a headset listening to a three-person conversation. Tense, Theremin-type background music begins before your copter lands as others take off and fly around. This lasts until 20:40--over six minutes of helicopters has to be a feature film release record! And what an opportunity to show off your system's ability (or lack thereof) to reproduce the director's intent. With RSL's C34E in-ceiling speakers providing the height information, my system shined. With music, the C34Es sounded lush and sparkly, with no noticeable harshness and more thump than I expected from an in-ceiling speaker. Yes, in All-Stereo mode, listening to these tracks, the C34Es brought a smile to my face. Paul Weller's "Broken Stones" from the album Stanley Road (Go! Discs) is a great mix with lots of "air" between the vocals and backing track. The reverb trail on Weller's lead vocal is placed all the way in the right channel, while the Fender Rhodes keyboard flanges right and left. Forget all that and just let the music take you wherever you want to go. It's magic! Pink Floyd's "Breathe" from Dark Side of the Moon (Harvest Records) is a track most are familiar with, and I include it for that reason and others. The very familiarity we may have with a song makes re-discovering it all the more powerful when something new is revealed. Using full-range speakers at every position when listening in all-stereo mode is perhaps one of the biggest differences you can make in your home theater and throughout your house if you are creating a whole-home audio system. As you walk around, your stereo orientation will change but your enjoyment will not! I'm glad the Atmos spec of full-range speakers everywhere yields a significant benefit even when you're not using their processing to watch a movie. With this track, the C34Es' performance was simply awesome. The Weeknd's "Starboy" from the album Starboy (XO and Republic Records) has LOTS of bottom end and "interesting" effects. The Toronto singer uses staccato punctuation on his lead vocal track against the throbbing dark techno beats inspired by Daft Punk's collaboration. This is one of my new favorite system demo tracks, and the C34E did a great job delivering the complete presentation. The C34E requires kind of a big hole to be cut in your ceiling, but the speaker really does vanish if done right. I think the extra effort to install in-ceiling speakers is worth it for Atmos, as I much prefer in-ceiling height speakers to the Atmos-enabled "bounce" approach. The C34E is an open-back design; there's no back box, which allows for more sound leakage into other rooms. If you have a living space above your theater room and want to control how the sound propagates, you may prefer a ceiling speaker with a back box--something like Monitor Audio's Controlled Performance Range. You can always buy or build your own back box or just use the denim insulation I mentioned earlier--but you won't get the quality-control aspect that you get when the back box is part of the design. Definitive Technology's DI 6.5R is $279 each, which makes it more than twice as expensive. I found the RSLs to have a little more bass response and to be capable of more impact, which I wouldn't have thought I needed (wanted?) from Atmos height speakers until I heard these. Another choice is the Klipsch CDT-5800-C II. It's $399, so we are once again talking about a speaker that's more than three times the price of the RSL C34E. Klipsch also sells Atmos-enabled up-firing speakers that are $499/pair for the RP-140SA or $399/pair for the smaller footprint R-14SA. The $125 Polk Audio MC60 is roughly the same price as the RSL. 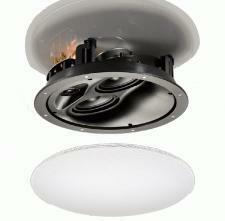 However, in my opinion, it's a utilitarian in-ceiling speaker that sounds okay ... but just okay. Even the Polk website does not indicate that it is meant for critical listening or full-range Atmos or DTS:X applications. Polk does make excellent in-ceiling speakers that would do very well indeed in those applications, but they are double or triple the price. This just points out how much value you are getting with the RSLs at the $125 price point. The ear can detect not only right/left information, but height as well. Your brain uses both your ears to locate a threat that can't immediately be seen by measuring all sorts of sonic attributes very quickly. From Wikipedia: "The Haas effect or the Precedence Effect is a Psychoacoustic Effect described by Helmut Haas as the ability of our ears to localize sounds coming from anywhere around us." As we seek to make the theater experience reflect this sonic immersion, technologies like Dolby Atmos and DTS:X emerge along with their attendant product and system requirements. Prior to Atmos, we got into the habit of using "lesser" speakers for rear and side surrounds. Now we need to rethink this and go with quality full-range speakers in every position. And quality full-range sound is exactly what the RSL C34E delivers. From my experience, for ceilings lower than nine feet, in-ceiling speakers become too directional, which somewhat diminishes the intent and indeed the capabilities of Dolby Atmos and DTS: X. In these instances, my recommendation would be to use Atmos-enabled speakers that bounce the height audio information off the ceiling. However, for taller ceilings like my 16-footers, I strongly recommend full-range in-ceiling speakers, and I can wholeheartedly recommend the RSL C34E. It would still be my choice were it much higher in price than $125. • Visit the RSL website for more product information. • RSL CG3 5.2 Home Theater Speaker System Reviewed at HomeTheaterReview.com. 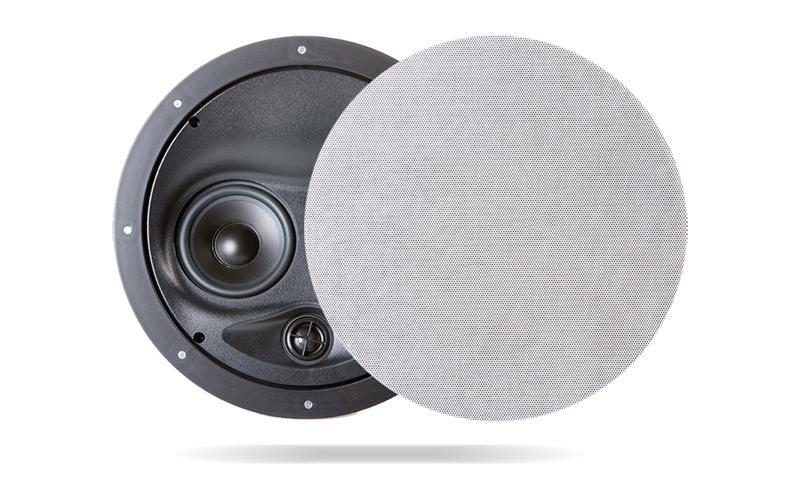 • New C34 Edgeless In-Ceiling Speaker From RSL at HomeTheaterReview.com.